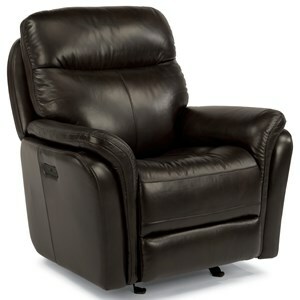 This casual recliner displays a clean, simple look that will make a great addition to your home. The classic rolled arms attractively slope backward to create a sharp and sleek look on this otherwise refined design. Built with comfort in mind, this recliner features a slightly contoured seat cushion, divided back cushion and a fully padded footrest for support from top to bottom. Complete with Flexsteel's signature DualFlex Spring System, you won't regret adding this recliner to your furniture collection. This recliner requires 5" of wall clearance. 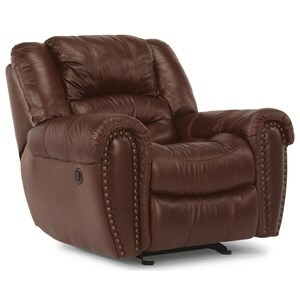 The Davis Casual Recliner by Flexsteel at Williams & Kay in the Anchorage, Mat-Su Valley, Eagle River, Alaska area. Product availability may vary. Contact us for the most current availability on this product. Fabric Options Available in South Haven fabrics through special order methods. Footrest Operation Lower the footrest by applying pressure to it in a downward motion. Lowering the footrest with the handle can damage the recliner. Padding & Ergonomics The High Resiliency Cushion uses a 2.0 lb. high-resiliency, high-density polyurethane foam core topped with 1.2 lb. density polyurethane recovery foam and bonded polyester fibers. Gel-infused memory foam cushions are available through special order methods. Create a cozy living room setting that you'll love to retreat to with the addition of a recliner from this collection. By offering a variety of pieces from power to non-power and rocking to swivel bases, you're bound to take home the perfect piece to enhance your lifestyle. Each model in this collection is equipped with Flexsteel's trusted DualFlex Spring System that will provide support through the life of the recliner. Choose between any fabric in Flexsteel's South Haven line and create a piece that reflects your personal style. The Davis collection is a great option if you are looking for Casual furniture in the Anchorage, Mat-Su Valley, Eagle River, Alaska area. Browse other items in the Davis collection from Williams & Kay in the Anchorage, Mat-Su Valley, Eagle River, Alaska area.